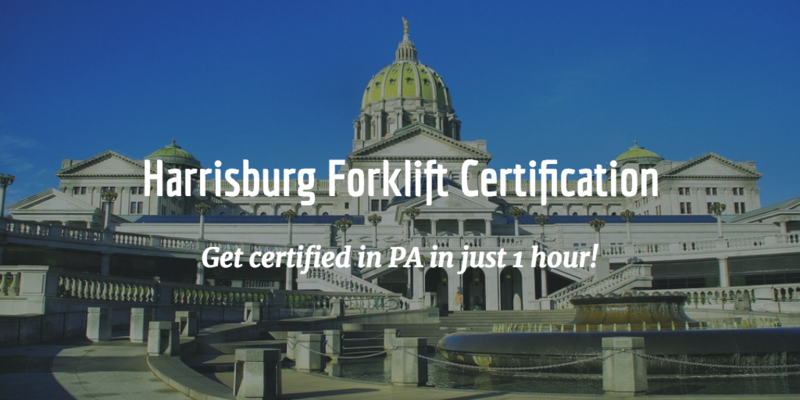 Harrisburg Forklift Training and Certification, Get Certified in 1 Hour! Harrisburg is the capital of Pennsylvania and is also one of the largest metros in the Central PA region. With convenient access to major roadways (PA Turnpike, I-83, and I-81) and some of the best infrastructure in the entire state, Harrisburg remains one of the best places in Pennsylvania to do business. If you need forklift training in Harrisburg, PA, FLC has all the training packages you need. Our OSHA compliant training courses mean that anyone looking for forklift certification for Harrisburg, PA has access. All you need is a solid internet connection and some spare time! Looking for Forklift Jobs in Harrisburg, PA? Contact FLC Today! Harrisburg-area employers – and all companies in Dauphin County and Central PA in need of forklift drivers – only want the best forklift operators. And that means they’re looking for the best-qualified forklift drivers. Without forklift training in Harrisburg, PA, you’ll miss out on prime employment opportunities in PA’s capital city. Don’t let these jobs pass you by – sign up with FLC today and make yourself a more attractive candidate for Harrisburg’s many employers in need of forklift drivers! • Train a Trainer – this forklift training course in Harrisburg, PA provides in-depth insight and knowledge for anyone looking to become a certified forklift safety expert. • Training Kit – need well-rounded forklift certification for Harrisburg, PA? Look no further than our popular Training Kit. • Bundle Package – includes the previous two training courses for one great price. This is the best value for forklift training in Harrisburg, PA. Whether you need help landing forklift jobs in Harrisburg, PA, or getting the most recent OSHA compliant training, the choice is clear for PA’s capital: FLC. Make a capital investment in yourself – get certified today with FLC. Once you have your forklift certification for Harrisburg, PA, you’re on your way to landing a great forklift job. Don’t delay any longer – call FLC today at (888) 278-8896.